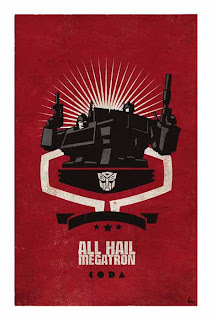 Also being solicited for July release in today's issue of Previews is TRANSFORMERS: ALL HAIL MEGATRON... #13. The series was only ever slated to be a 12-part saga, but word and sales on the book have remained so steady that the four-part "Coda" we talked about before has become AHM 13-16. Each of these four issues will contain two 11-page stories by different creative teams--a couple of which will factor into future plans in a big way--and each of these stories either wraps up elements from Shane's 12-part story, sets up events for the future or delves into plot points that fans that early on were inconsistencies (meaning, Nick Roche will tell the story of how the Kup from his SPOTLIGHT issue became the cigar-chomping fighter in AHM). The other from AHM cover artist Trevor Hutchison (who celebrated a birthday yesterday). Check out Previews in stores today for more information on issue 13, and a press release announcing this and more will be working its way around the 'net soon, too. Ha, when I first saw the title I thought it would be a Star Trek update. :) Thanks for the update and I look forward to hearing more! "Ha, when I first saw the title I thought it would be a Star Trek update. :) "
"Same here. Too bad it ain't :("
So, AHM is really running that strong? I'm a bit behind, but my general impression was that a bunch of the community was very harsh. "So, AHM is really running that strong? I'm a bit behind, but my general impression was that a bunch of the community was very harsh." Sure, the online community has been particularly vocal and very harsh. 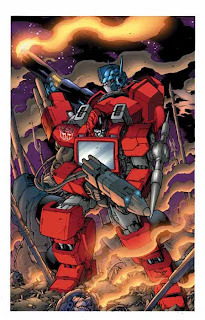 But, despite that, AHM has been IDW's top selling TF title (based on ICV2 charts) for the duration of it's run; even in the face of a few new #1's debuting. It may not be a chart buster, but it has seemingly held it's own and been steady. My opinion...those who do like it aren't posting online much because they get worn down by people who are hating on the series...but somewhere some people are enjoying it. When might said press release be, well...released? "When might said press release be, well...released?" As soon as we have it, so will you. Details and images will also be in AHM 12, but I know that's a ways off. We'll be talking them all up at BotCon later this month (May), too. 2009 Eisner Award nominations are live! First present of the day!